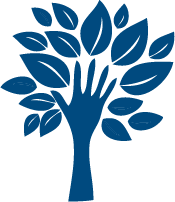 At Sheffield Platers, Incorporated, our respect for the environment is unwavering. This unqualified respect is reflected in both our management and our metal finishing processes. We are committed to honoring our internal mandate for resolute environmental stewardship. Sheffield Platers’ business ethics and stakeholder relations are based on consistency and high morals. 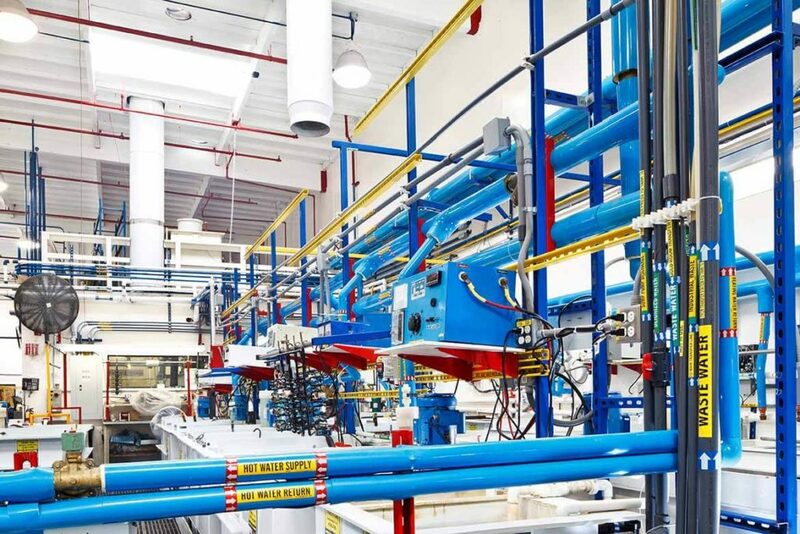 This is stated in our mission statement and is also expressed through our environmental work by efforts to constantly reduce the environmental impacts of our electroplating processes. Emphasis is now to be placed on looking at our environmental management in a more holistic and systems oriented approach. Specifically, focusing on source reduction, process improvement and modification, with an appreciation for the protection of biological chains. 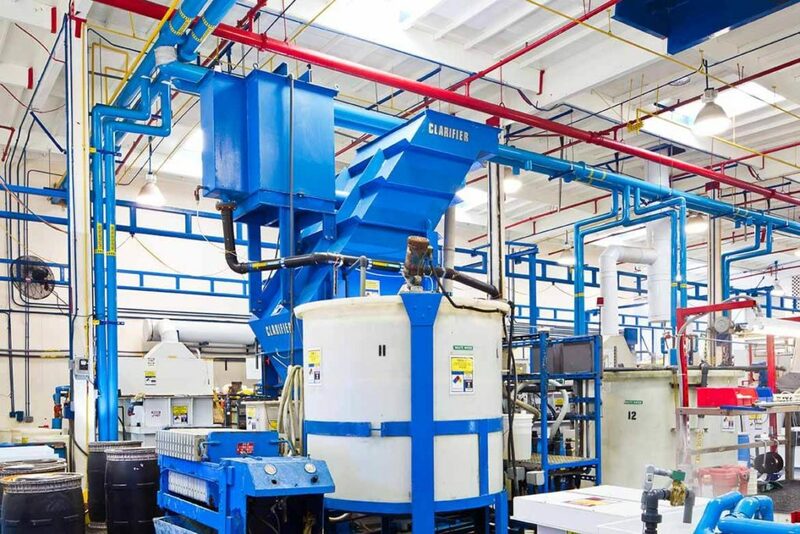 We maintain a commitment to 100% compliance with all applicable environmental laws, and we are committed to effecting continual improvements in our processes and to developing environmentally compatible metal finishing technologies and processes. 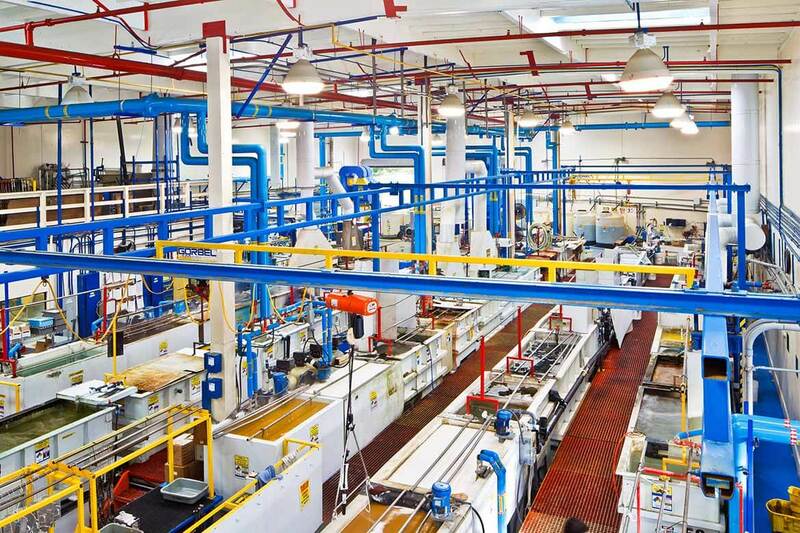 Sheffield Platers conducts its operations in a “ state-of-the-art facility” in San Diego, California. 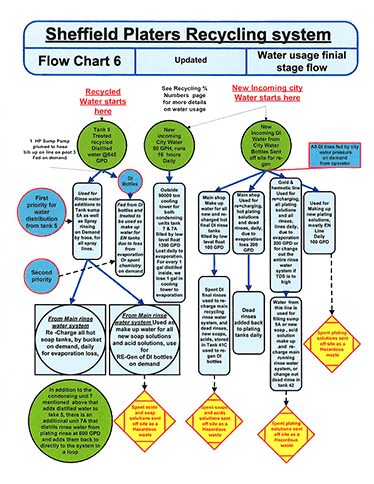 The old and still prevalent environmental management plans focus on “ end of the pipe” control technology in response to command and control statutes and regulations at all levels of the government. 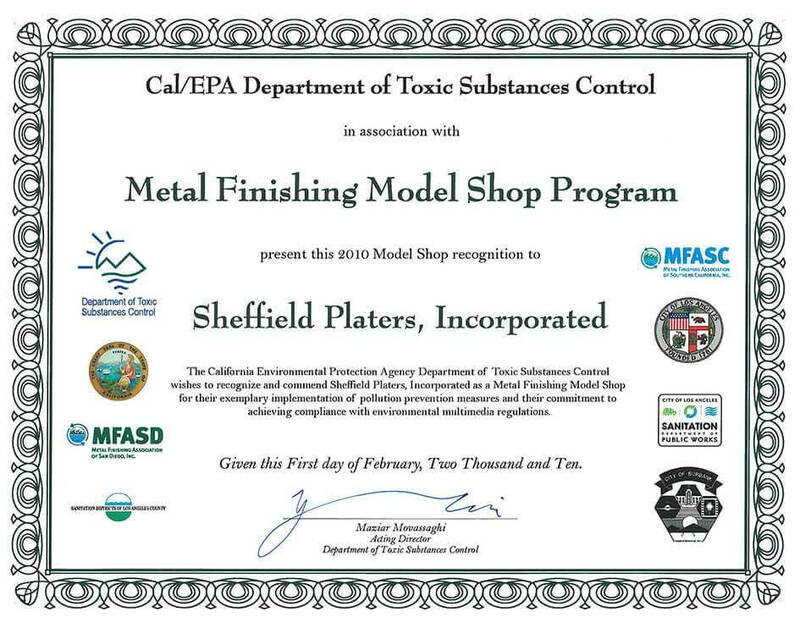 Sheffield Platers is leading the way in which metal finishers and chemical engineers look at situations that impact the environment: For example, addressing the problem at the “front of the pipe” instead of the “end of the pipe”. Here is a brief look at some of the things we have accomplished. Sheffield provides RoHS compliant services for most metal plating processes. The definition and aim of the RoHS directive is quite simple. The RoHS directive aims to restrict certain dangerous substances commonly used in electronic and electronic equipment. Any RoHS compliant manufactured part is tested for the presence of Lead (Pb), Cadmium (Cd), Mercury (Hg), Hexavalent chromium (Hex-Cr), Polybrominated biphenyls (PBB), and Polybrominated diphenyl ethers (PBDE). For Cadmium and Hexavalent chromium, there must be less than 0.01% of the substance by weight at raw homogeneous materials level.For Lead, PBB, and PBDE, there must be no more than 0.1% of the material, when calculated by weight at raw homogeneous materials. Any RoHS compliant component must have 100 ppm or less of mercury and the mercury must not have been intentionally added to the component. Some military and medical equipment may be exempt from RoHS compliance. Please let us know your need for RoHS compliance on your orders and we will likewise note compliance on our material certification. Our concern for the environment is reflected at every level of our company and our employees participate in an incentive program, which is designed to encourage, recognize, and reward strict adherence to the highest environmental standards. We must increase the knowledge and commitment of our employees to ensure compliance with both internal and external guidelines on environmental protection. We need to take our knowledge of pollution prevention home with us and disseminate that knowledge to friends and family. For more than five decades, Sheffield Platers has been in the forefront of the plating industry in the research and development of innovative technologies for our process rinse waters, and point source reduction. We invite you to join with us in our commitment to protecting the environment through responsible use of our natural resources.